There is a new single out by David Usher - "Kill the Lights" available on itunes - and there is my unsubtle David Usher plug. Its a pretty decent song :D. Today was a nice family day - and while I didn't get a sunburn, nearly every muscle in my body hurts. I thought it was time for a non-gardening post. I've been throwing them up because they are fast and don't keep me from my thesis for more than a few moments. I'm giving myself about 5 minutes to get this one done - so I take no responsibility for my spelling or writing skills - this is a rapid fire news dump, not an essay. 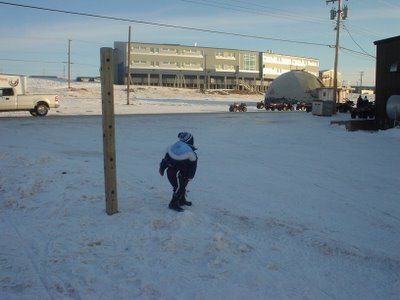 Pictured above is my new workplace in Baker Lake - Jonah Amitnaaq Secondary School. Obviously, I haven't been up there, but I was graciously given permission by Curtis of the Northern Sights Blog to borrow his until I could take some of my own. There is even a floor plan online. I think the hardest thing is that I have so much to do, but I'm dying just to get ready and go. Anyone who has suggestions for good teaching resources for northern teachers - I'm all ears. Not that there hasn't been a lot of tasks to do all ready. I've been tracking down all the paperwork I need to get sent in order to apply for my Nunavut teaching license. I've been trying to compile some lists of things to move. Moving up north is a pretty big deal - and you really have one shot to get it right - since once you are there it is extremely costly to replace the things you forgot - if you can even get your hands on them. I somehow survived in Kashechewan with 7 hangers. The biggest thing I forgot when I moved there was a telephone (I did manage to remember my answering machine). Fortunately, another teacher lent me one until my mom could mail me one. I do have to procure quite a few items, to replace the stuff I sold when I moved back from New Brunswick - so that will be fun or crazy or something. I think the next big job is to set up a staging area for moving and then starting the pile and the list. I think I have 3 weeks. But to add to the complication, I need to leave out the survival essentials to take with me on the plane because my belongings could get delayed for a few weeks after my arrival. My other big job for June was to complete my sealift order. I know a bit about them from other folk - but I didn't get a chance to put an order in when I was in Kashewean because I didn't start until a few weeks into the school year. Thus, food was expensive and kind of limited in variety. But I did mail myself a lot of the basics. Unfortunately, sending stuff to myself via Canada Post is quite a bit more expensive than my boxes would have costed to ship to Kashechewan - so I'm glad that I've had a chance to make a sealift order. I'm sure I've made mistakes - that I'll wish that I didn't order 12 900g bags of brown rice or a case of nutella I'll also probably kick myself for forgetting stuff too. Luckily, I was able to do my order with the person I'll be sharing my appartment with - so that in a lot of cases we could split cases of stuff which will improve the variety for everyone. I'm set to put the order in by Wednesday, which gives us a few days to think about what we've put in and change our minds a few times. I did a fair bit of research into the process and finally went with the northern store. I'm not sure they are the cheapest (but I think they are pretty good) and I don't think they have the best variety and there was no way to get around having to buy stuff in whole sale quantities - however, they had their catalouge on the internet and were able to give me an exact price for both the item and the shipping (which is good since we are going in on the order together and have to sort out that sort of thing) and the shipping price gets my food from their shelf to Baker Lake without me having to make any arrangements. I figure the northern coop has been doing this a long time - and as an inexperienced sealift orderer - I figured that it was the safest bet. So... I'll maybe post up how good my grocery shopping went next summer - and let you know what my errors were. So - now all I have to do is finish up writing my thesis and then finish editting it and then defend it while doing moving prep and a bit of unit planning and then maybe I can sleep on the plane. So, last but not least because I have a bunch of little things.. here are a mass of updates. 2. In gardening news: the Lupins are getting their second wind, the petals are starting to unfurl on the daisies, and one echinacaea flower has started to grow. I have a few different types - its seems to be the largest - so it could be the magnus or it could be the alba - as the petals appear white so far. The first daylily (a yellow one) has also flowered. 3. In knitting news, there are only 7 inches left to knit on my shawl - which means I've knit an inch in the last 1.5 months - and most of that at my Gramma's last night. Once I'm up north I'm going to start my Philospher's Wool Sweater and probably a pair of trillium socks that match my new shawl. Until then I hope to finish up the shawl - and start my second crayon jaquard sock. I knit the first one entirely during my breaks working at the greenhouse. I miss the greenhouse - I can't even see a window from my desk. 4. Gas is at $1.34/L - so its a good thing that I've driven my car less than 2 km in the last week. I'm hoping to make a morning bike ride part of my routine - somehow. 5. My hair is finally long enough to tie back! 6. I have a strap and camera case for my new Camera and some generous donations to my camera fund (thanks folks for the awesome birthday gifts everyone), I'm not allowed to get the camera, until after my thesis is written and everything else I need is done - but hopefully by the time I get on that plane I'll have my equipment in order to take some awesome pictures to post here. Of course, I'll probably have to cut down the size and resoluation for the sake of my internet connection, but I'm pretty excited. 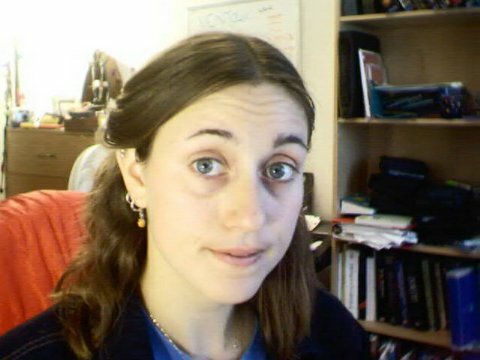 Amusingly, I'm exactly double the age I was when I got my first real camera. My family tricked me by giving me a stuffed squirrel for my birthday (which I do still have and like muchly) and then surprised me with the camera at my grandparents. I still have the camera, but a spring in the shutter assembly gave out while I was at camp - so it has been retired. I'm sure I'll let you know when I get my first pictures with it. At least I think it is the Horseshoe, it might have been the Mod Club or well somewhere. It was a bar in Toronto near to the old Maple Leaf Gardens. The Concert was awesome. Gabe took most of the pictures, but I thought this one could be mine because it looks like whoever took it was shorter than the people in front of them.. but I could by wrong... so credit possibly to Gabe because I'm not sure I took any that weren't blurry. This is part of my catching up on the last few months on things other than my trip to Thunder Bay. And I'm really having trouble with English this morning... sorry about the discombobulated post. Good concert - we met up with Geoff and Erin... it was a blast.